(Kali Sinclair for NaturalNews) We are quickly approaching the New Year, the time when we all take stock of the year before and vow to change or improve. For the vast majority of us, New Year’s resolutions include some version of eating healthier or eating less. For a week or two, we just might give it a try. But old habits die hard, and soon we slip back into the usual routine. I believe there are good reasons new eating habits don’t stick. We don’t feel better; we just feel deprived. And new routines are usually too time consuming. If you were to make one dietary change this year–just one – this one could change your life. Make a resolution to eat raw, fresh, organic produce each day. Your goal is to make raw produce 80% of your diet. For the majority, this will be a radical change, but it doesn’t have to be a difficult one. This is not the usual, wimpy salad. This salad is an adventure and the most nutritious salad you will ever eat. It is so good, you’ll never get tired of it. That said, you can always change it up. Just be sure you have a very large variety of veggies in your salad. Forget iceberg lettuce. From now on, your “lettuce” should consist of at least five of the aforementioned leafy vegetables. Then you top it with shredded root vegetables. Zucchini and squash don’t last as long as the root veggies once they’re shredded, so take that into consideration when making them in advance. I also like to add soft-boiled eggs and raisins and then top it off with a mix of balsamic vinaigrette, apple cider vinegar, and either flax seed oil or an omega 3 oil blend. Mix it up well to get the seasonings and dressing over all of the vegetables. I also used to add sheep feta cheese and chicken or steak, too. If you’ve got a meat eating friend who’s health you’re trying to turn around, and they balk at the idea of salads, then throw in a nice sheep feta and some meat. They’ll love it. 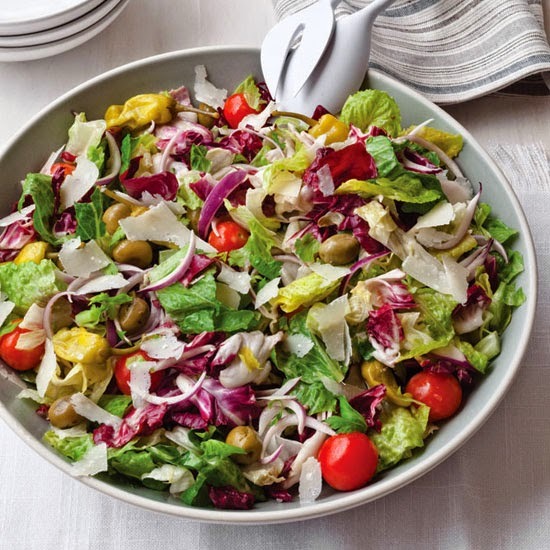 Eating one salad a day plus several servings of raw fruit each day is a habit that is easy to include in your daily life if you prepare one or two big batches of salad a week. You will feel so much better, so quickly, you will not want to go back to your old habit of eating a sandwich and chips, fast food, or a frozen entree for lunch. If you are detoxifying, or dealing with illness and wish to incorporate these salads, be sure to make them fresh each time. Of course, whenever possible, buy organic produce. Get to know your farmer’s markets if you have any near. And from now on, always have a salad in the fridge waiting for you. You’ll start to crave them in no time, as other habits, the not so healthy ones, begin to lessen their hold on you. The transformation is amazing. More than anything else, in my experience, these salads have been the precursor to a much healthier and disease free life for so many people. Seriously. These salads are that powerful. Put your health in your own hands….